If you are not familiar with the Masons please stay a few minutes and learn of this great fraternity. It is a fraternity with a serious purpose. By improving the individual we hope to improve our communities and thus the world. We suggest looking through the pages listed below, as well as the rest of this website, for more information that may be of interest to you. Please email us if you have more questions. Freemasonry is not a stuffy secret club for old guys. Freemasonry is relevant and needed in a world desperate for organizations dedicated to serving humanity and local communities, honorable living, tolerance, moderation, self-reliance, equality, and liberty. In addition to basic “Craft” Masonry, there are Appendant groups for men only, women only, men and women together, and teenagers. Freemasons unite with each other and their families in bonds of friendship and mutual assistance. A mutual tie that in this world is greatly needed. It is not the intent of Freemasonry to replace or alter anyone’s religious convictions. Rather Freemasons believe that all people are children of God. As such we should find common ground in order to serve God’s children. Each person has a right to worship God as their conscience dictates. Freemasonry does not replace a person’s religious affiliation or activity. A person should look to their house of worship for salvation. Therefore a Mason’s Lodge is not a church, but a meeting place for people of common interests to gather together and work in unity. A few trite lessons upon the rudiments of architecture, a few ordinary maxims of morality, a few unimportant and unsubstantiated traditions will no longer satisfy the earnest inquirer after Masonic Truth. Let him who is satisfied and content with them, remain where he is, and seek to ascend no higher. But let him who desires to understand the harmonious and beautiful proportions of Masonry, read, study, reflect, digest and discriminate. 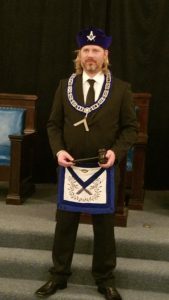 The true Mason is an ardent seeker after knowledge; and he knows that books are vessels which come down to us full-freighted with the intellectual riches of the past; and that in the lading of these Argosies is much that sheds light upon the history of Masonry, and proves its claims to be regarded as the great benefactor of mankind.